Except I'm not sure why. Is threshhold for cool 6, or is there some kind of bonus if other categories are over the 7 I thought was required for each. It would be nice if Maxis would actually tell players the criteria! I know we thought that cool might require more stickers because of this exchange where simsaddict got 3 stars for 5 scary stickers but I got 2 stars for 5 cool stickers. Whereas you got 6 cool stickers and got the full 3 stars. Then, because it seemed they were always changing how many stickers got 3 stars, we thought it would be good to aim for at least 1 more sticker than what got 3 stars the week before. Which lead to 6 stickers for almost all categories but 7 stickers for cool. But now it looks like we just need 6 cool. I agree, they need to let us know what the conversion rate for stickers and stars is! My new sims could use some help with stickers. Are you going to host a party at the weekend? I'd try to attend, so my sims get them to know. 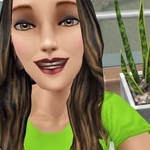 Currently your former sims show up in Mina's and Mick's contacts. It would be nice to have a heads up on my other friend's sims. Are Troy and Maria C. still active in your games? In my game it's only Mick who could use some of all stickers. Mina is set and Kim and Marc have been retired. Glad for update on your sims and their needs. I also found fabulous hard this week. What I thought was fabulous, others tagged as classy or cool. I plan on hosting a party tomorrow if RL doesn't interfere as it did today. Too late now. I try to alternate between parties early and late in day as I have SimsMobile friends from different time zones. Maybe some of you can meet there. I keep my sims a long time, so no change, Erin. I may pick up a couple, as I have one more party to go to today. Yes, I plan on hosting a party on Saturday, my timezone, like I usually do. My sims don't have many relations right now so hopefully they'll be able to keep everyone as a contact. I can't wait for them to me your sims, Erin! With SKatF's party there's at least 2 people from the forum planning to throw a party tomorrow. I normally start mine pretty late at night/early in the morning before the party counter resets but I can start it earlier if it helps out. I can start it around 8 am tomorrow. I'll check here first thing in the morning. Thanks for the heads up, SKatF! Sarai is good to go for stickers. Constance needs 1 fabulous sticker. Corey needs 2 cool stickers. Julien needs 1 fabulous and 3 classy stickers. Oy vey. I got my own sims mixed up. I got Corey and Julien mixed up. Corey is the one that needs 3 classy stickers. Corey is actually the only one who needs stickers now thanks to everyone who has come to my party so far! This morning I activated my new sims Paige and Eric. Both are children of Mina and Mick and they will stay longer in my game. I'm going to host a party to introduce them today (tuesday, july 17th) around 12 am GMT.